Repair, restore, renew is more than just a slogan. It represents the essence of who we are at New Creations USA. 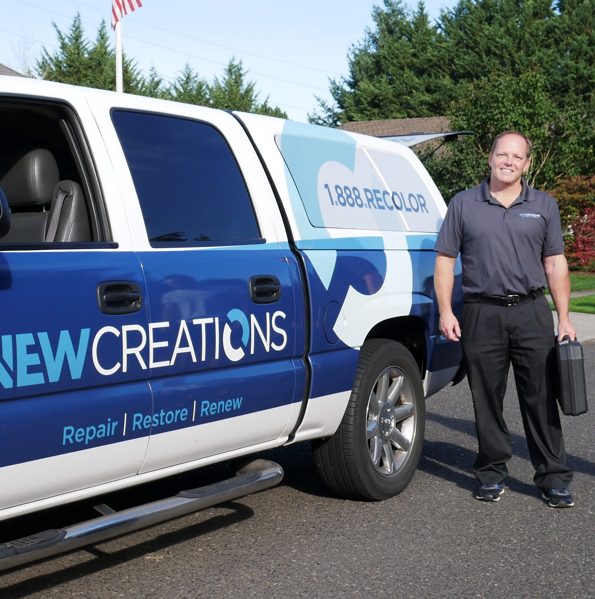 New Creations USA is a mobile restoration service located in Vancouver, Washington, and for our techs, every day is a fascinating journey. As a mobile restoration company, it’s fitting to talk about the journey our New Creations USA has taken over the last 30 years. In 1988 Larry Stevenson began New Creations in Portland, Oregon. Two years later, in 1990, Larry moved the company to Vancouver, Canada, where he met Dave Stone. Dave was in the last year of university with his girlfriend, Kelly, when Larry made a job offer to him. Dave and Kelly finished university and got married, beginning both their lives together and their work with New Creations. Ten years later, Dave and Kelly began to explore the possibilities of expanding New Creations into the United States. They decided to move to the U.S. with their two young children, Alex and Mack, settling into their new life in Vancouver, Washington with the future and a business venture ahead of them. But in 2008, the recession hit, and Dave and Kelly struggled as business slowed. Through the struggles, they discovered that adversity and hardship could be the very things that are needed to grow. Before the recession, both divisions of New Creations had spent their efforts with a laser focus on repairing auto interiors, RVs and boats. As the economy slowed down so did car sales, reducing New Creations USA’s market. With the recession, Dave and Kelly began to explore new ways to expand their focus. They began to target their efforts on developing furniture and property restoration which was a natural expansion of their talents. Now, New Creations USA’s furniture and property restoration business is a vital part of the company. Between auto interiors, boat interior repair, furniture upholstery repair and home restoration, New Creations USA techs have developed skills and training to be able to tackle virtually any project. New Creations USA is continuing to expand its business within the Pacific Northwest and is always looking for quality techs to hire as the market, and national warranty clientele continues to grow. New Creations USA provides service to Vancouver, WA and Portland, OR for interior, vehicle, boat and furniture repair and restoration. Repair. Restore. Renew. That’s what we do. With over 27 years experience, repairing the many things we do at New Creations USA is second nature for Dave. He is always looking for a challenge, and there is virtually nothing he won’t take on. After spending 15 years coaching soccer, Dave is now able to focus that extra time and energy growing New Creations USA. He also manages to carve out a little time for golf as well. “Who’s that wonderful girl I was talking to in your office?” is a question Dave gets all the time. The answer is Kelly Stone. And she’s taken. Potential clients call New Creations USA for help solving their furniture upholstery or home restoration issues, and Kelly is so warm and accommodating, leaving the customer feeling confident that their project is in good hands. 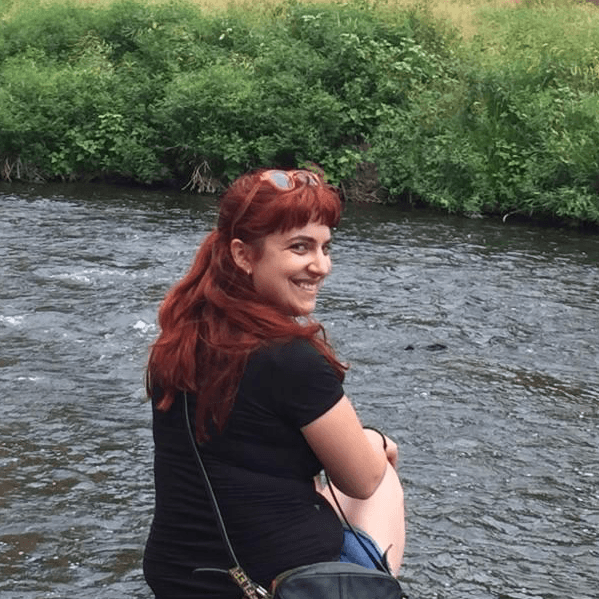 If you ask Kelly, she will tell you about all her plans to travel and explore the world. 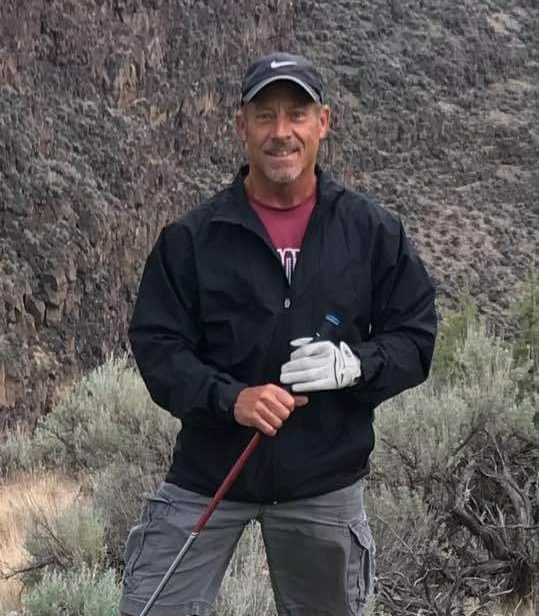 Bryan is an avid fisherman and golfer and New Creations USA RV Interior Specialist in Portland, Oregon. His background in construction and remodeling adds valuable skills to his abilities. He can cut and install a new linoleum floor for our customers on location providing quality interior repair and restoration. 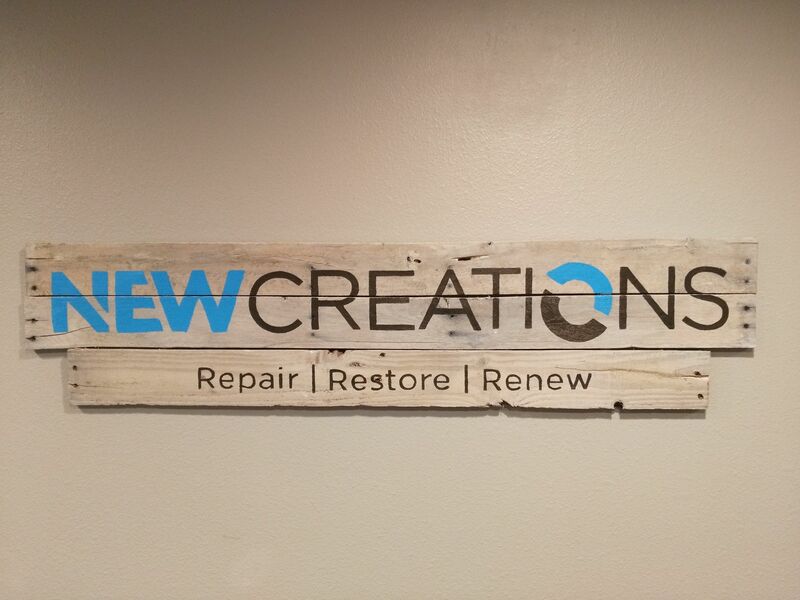 New Creations USA is Growing! We are proud to announce the addition of a great tech to our team. Brad Buchanan has joined Portland metro team. He comes to us with over 30 years experience in furniture repair. He is a certified wood expert which is a great fit with so many things that New Creations USA fixes. 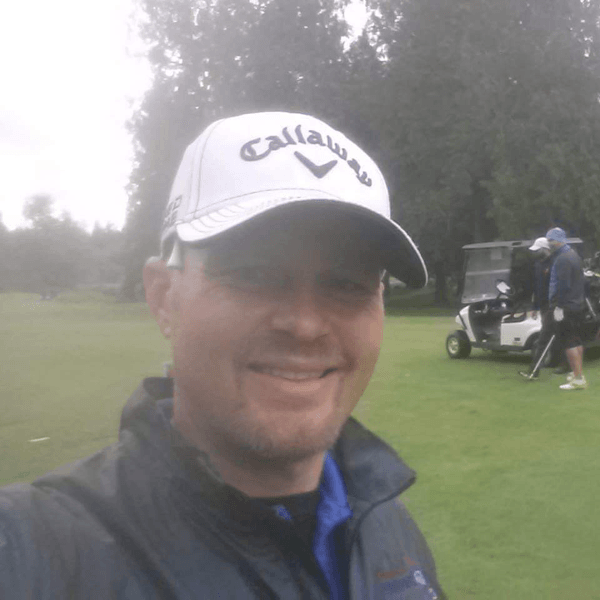 Brad is an avid golfer and a car enthusiast. He also is known for his annual Christmas light display at his home. Hufflepuff, Gryffindor, Slytherin, or Ravenclaw? If you want to know which Hogwarts’ house you would best belong to or anything else about Harry Potter, Alisha can fill you in. 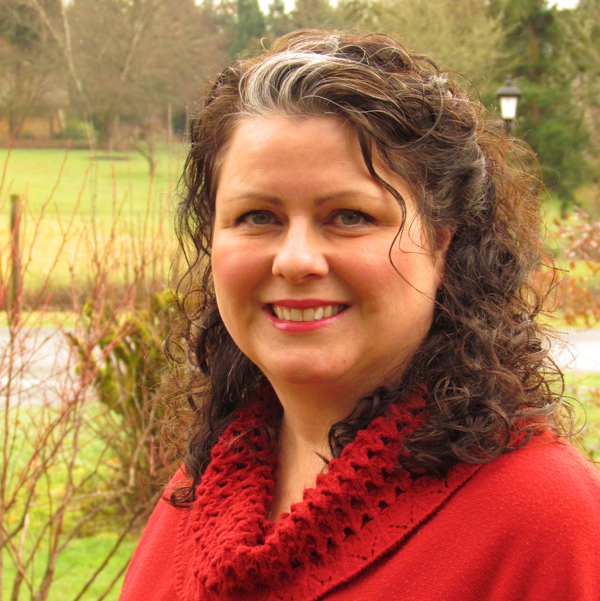 She is New Creations USA in-home furniture restoration expert in Portland, OR and we get rave reviews about her from our customers. 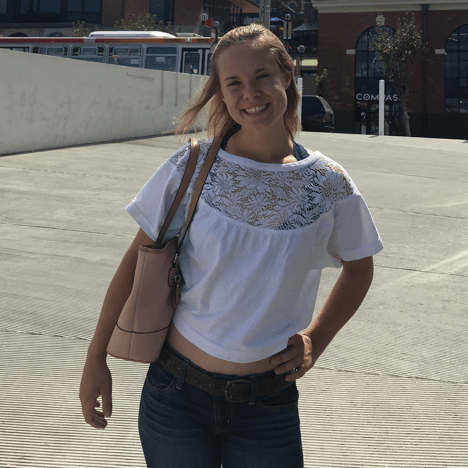 Sydney is a full-time student and a very diligent administrative assistant. She is very organized and helps take care of our restoration customers. On her days off, she enjoys hiking and skiing. We are always looking for new techs to join our team! What is New Creations USA looking for in a tech? Problem solver-intuitive people will thrive at New Creations. Our techs think outside the box for solutions. Good communication skills. Our customers come first and communication is the key to quality customer service. Good interpersonal skills-working. Our techs work in people’s homes and it is part of our promise that our customers feel comfortable with our professionalism. Teachable and trainable. Our techs are willing to gain the skills they need to do a quality job every time. Independent and self motivated. Techs work in the field alone 90% of the time – no clocking in and out. Have to be able to see color-color matching. This skill is used every day so if someone has any degree of color blindness this is not the job for them. Own your own vehicle. A truck with canopy is the preferable mode of transportation. Good time manager who is on-time. Want to be a business owner. Our techs have the opportunity to own their own franchise. What are the benefits of working at New Creations USA? New Creations USA provides all the training and tools to make you a successful tech. New Creations USA provides a cell phone with a work number and all the tools and supplies needed to perform duties. Progressive commission pay structure. The more you produce, the higher your base rate and bonuses. If you have an entrepreneurial mindset then New Creations USA gives you the ability to work towards a franchise. Working for New Creations USA allows additional tax write offs because you are using your own vehicle and traveling from job to job. Gas, maintenance, food on the road, dedicated office space at home can be tax deductions. Flexible schedule. If you want to work weekends you can. If you want to work 4 days a week you can. If you need days off just let us know in advance. You are never alone to solve a problem. Support is a phone call away. Not only do you have Dave but there is a network of 100 techs in Canada and the US to help troubleshoot or bounce ideas off of. Yearly training seminar in Vancouver, BC paid for by the company. Working for New Creations USA is rewarding! Restoring pieces give you the satisfaction of seeing property repaired and a customer amazed. I wanted to Thank you and Alisha Beck too for such a wonderful & professional experience today. Alisha Repaired my Flexsteel Recliner and needless to say I am more than happy with the outcome. Alisha is Fabulous and her work is flawless. I had forgotten how comfortable my Chair was and still is, I wish I had found you guys sooner. I appreciate all your good work. I will highly recommend you to others in the future.